A guest post by Luke Rees. 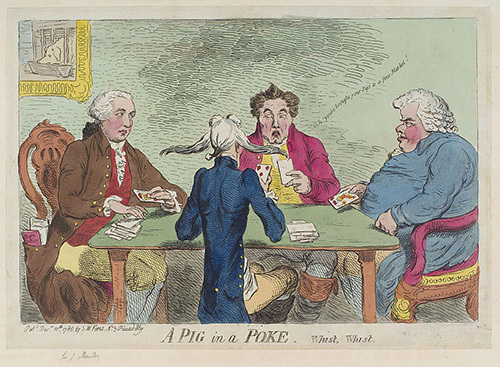 Gambling has long been ingrained in British society. This is perhaps due to the historically rigid class system and the fact that gambling is one of the most efficient redistributors of wealth – or simply due to the fact that, for many, gambling can be a lot of fun – the British have long had a deep and meaningful relationship with Lady Luck. A relatively static working-class gaming culture has existed in taverns, inns, and various other dens up and down the country for over a millennia. In these primitive establishments, gambling was generally associated with some form of physical violence – animal baiting and other gruesome blood sports sadly being the most popular subjects for betting on. However, games of chance such as ‘hazard’, ‘queek’ and ‘chequers’ (all of which are played with dice and demand no skill) were commonplace from as early as the fourteenth century. It was during the late eighteenth century that gambling became more sophisticated in England and began to influence all levels of society. This was a century of contrasts: an ‘Age of Enlightenment’, but one which propagated slavery and colonial expansion; an age of industrial and technological innovation, but with a corresponding escalation in poverty and squalor. In this period of contradictions and inequality, it was the palliative effects of gambling that seemed to hold universal appeal. ‘The Hazard Room’ – a 1792 painting by Thomas Rowlandson. 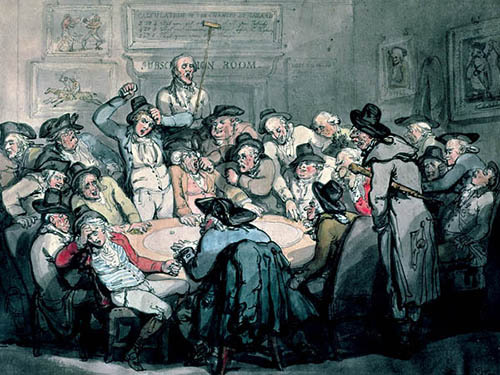 The epicentre of British gambling migrated from Bath to London in the late eighteenth century, where many exclusive clubs began attracting men from the upper echelons of society. Between 1600 and 1880 London developed into a global centre for commerce, with its population increasing from 200,000 to around five million. The availability of luxuries increased at this time, as did a boom in the economy spurred by a diversifying trade system. This system allowed businesses to run on borrowed capital, which subsequently popularised the idea of speculation as a way of making profit. It is no wonder that a society addicted to luxury and speculation also institutionalised and glamorised gambling. Some of the most famous gentlemen’s clubs of London included White’s, Brook’s, The Cocoa Tree, and Almack’s, and were often referred to as ‘golden halls’ (in contrast to the ‘copper hells’ which the lower classes frequented). These clubs developed out of coffeehouses and other existing meeting places for the privileged classes. White’s, for example, developed from a regular meeting of wealthy men at a chocolate house. Membership to a gentlemen’s club was vital to the integrity of a man of standing. Each club had particular political affiliations and offered the member, through proximity to men of state and lawmakers, the opportunity for corporate and political networking. But don’t imagine these clubs were merely the setting for sober and serious dinner talk! This was a social, rather than a professional setting, and these men could drink, carouse, and gamble as rowdily as the next common swindler. The only difference was that the stakes were much lower, and the bets much higher. The early nineteenth century was primed for an explosion in frivolous consumption from the aristocracy. Peace had returned to Europe after forty years of war with Napoleon, and a generation of bored young aristocrats found themselves with far too much time and money on their hands. Gentlemen’s clubs offered these men the chance to waste huge sums of money betting against the house and each other. In a society obsessed with wealth and status, this form of conspicuous consumption was a way to pass time, but also an important way for the aristocracy to assert itself. The types of games played in gentlemen’s clubs were also a means for the aristocracy set itself apart from the lower classes. Whilst the majority of games played in the ‘hells’ were based on pure luck, gambling in gentlemen’s clubs required skill. As a result, playing cards were the main device used by the aristocracy, since they were more expensive than dice and involved more sophisticated games. Whist was the most popular gentleman’s game and is a precursor to the modern game of Bridge. It involves a high level of concentration to keep track of cards, as well as knowledge of the extensive technical jargon. This was an exclusive game for the well-educated, and a skilful card player would be revered and respected by his peers. This was also a betting game, and the players who bet big could gain notoriety. The Duke of Wellington allegedly bet £100,000 on whist on any evening at White’s. At other times the wagers could have a much darker side. Horace Walpole recollected an infamous bet made between two of White’s members that a man could survive for 12 hours under water. Allegedly the men hired a ‘desperate fellow’, sunk a ship with him on board, and never heard from him again (the stake was £1,500). Although there is no evidence in White’s books of this bet being made, it helps to illustrate the rampant gambling culture that existed. Brook’s is often considered the most infamous and fashionable of the top clubs, with the average age of its members being just 26. Needless to say, aristocratic manners and gentility were not the priority for these young patrons. A peculiar etching from 1772 depicts the club’s members around the gambling table, all dressed up as witches and uttering a spell: ‘Double, bubble, toil and trouble. Passions burn and bets are double!’ It seems gambling was a ritualistic compulsion for these men – a compulsion undercut by the caption to the photo which delivers a fateful prophecy: ‘ruin enters as fate runs out’. The dissolute Regency Period saw the craze of heavy gambling reach fever pitch. William Crockford was one of the most prominent figures of this age, whose incredible rags to riches tale was fuelled entirely by his aptitude for gambling. Beginning his career as a fishmonger, half a century later he had founded the ‘Crockford’s’ gambling club and become one of the wealthiest men in England (worth the equivalent of £95 million today). 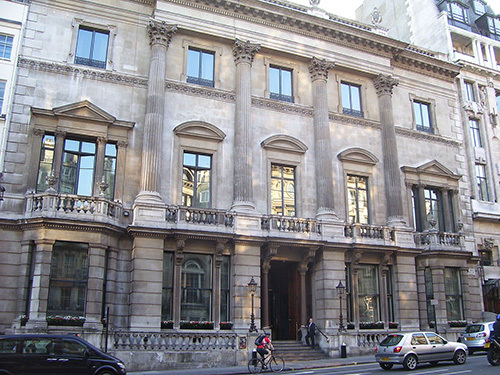 Crockford’s original location at 50 St. James’s Street. Crockford made his fortune taking money from the pockets of reckless aristocrats, thereby helping to democratise the British gambling culture. And whilst he cut away the elite nature of gaming, the government also cracked down on the spread of new ‘hells’ at the bottom end of society. Clubs and gambling houses held different motives and intentions by this time, with the divide between upper and lower class gaming rituals gradually being reduced. Towards the middle of the nineteenth century, the establishment of institutionalised gambling – the casino – had emerged. Luke is a history writer from London who is associated with Europalace Casino. He enjoys reading, cooking, and playing piano.